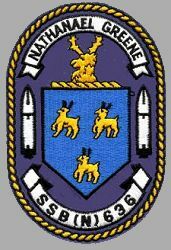 USS NATHANAEL GREENE was the 19th LAFAYETTE - class nuclear powered fleet ballistic missile submarine. Heavily damaged in a grounding in the Irish Sea on March 13, 1986, the NATHANAEL GREENE was deactivated in May 1986 and subsequently decommissioned in December 1986. This decision was partly made in order to satisfy the SALT II limitations. Stricken from the Navy list on January 31, 1987, the NATHANAEL GREENE entered the Navy’s Nuclear Powered Ship and Submarine Recycling Program at the Puget Sound Naval Shipyard, Bremerton, Wash., on September 1, 1998. Recycling was finished on October 20, 2000. This section contains the names of sailors who served aboard USS NATHANAEL GREENE. It is no official listing but contains the names of sailors who submitted their information. Click here to see which USS NATHANAEL GREENE memorabilia are currently for sale on ebay. January 29, 1970 Charleston, SC USS NATHANAEL GREENE is grounded for seven hours in thick fog in Charleston harbor, SC. The Navy closes the harbor while the submarine is refloated. Reports indicate no damage to the submarine. August 11, 1984 Irish Sea USS NATHANAEL GREENE reportedly loses her propeller in the Irish Sea. The submarine proceeds back to Holy Loch, Scotland, using its secondary propulsion system. However, facilities at the US base are unavailable, so the submarine is towed to the nearby British submarine base at Faslane, Scotland. On August 18, 1984, while the NATHANAEL GREENE is drydocked at Faslane, a fire breaks out on board the drydock the submarine is docked in. The fire is quickly extinguished and the submarine is not damaged. March 13, 1986 Irish Sea USS NATHANAEL GREENE runs aground in the Irish Sea, suffering external damage to her ballast tanks and rudder. A US Navy spokesman says there was no effect on the propulsion system, no injuries and no damage to the Poseidon nuclear missiles. The submarine initially sails to Holy Loch, Scotland, under its own power for emergency repairs. It then leaves Scotland on April 25 and travels submerged to Charleston, SC. The extent of the damage subsequently leads to the decision to decommission the NATHANAEL GREENE, partly in order to satisfy the SALT II limitations. Nathanael Greene was born 27 July 1742 at Warwick, R.I. An iron founder by trade, he served in the Rhode Island Assembly and in the Kentish Guards. Appointed Brigadier General by the Rhode Island Assembly, and Major General in the Continental Army, he was given command of a detachment of militia at the siege of Boston and was charged with protecting that city after the British withdrawal. He helped to plan the defenses of New York and served with General Washington at Trenton, Brandywine, Germantown, and Valley Forge. Quartermaster General in 1778, he reorganized the Army’s logistics. He also fought at Monmouth and in the Rhode Island campaign, and presided over the trial of British Major John Andre. In 1780, he was appointed command of the southern forces, winning the battles of Cowpens and Eutaw Springs and compelling the British forces under Lord Cornwallis to fall back on Charleston. He died in June 1786, near Savannah, Georgia.